The Lindavista Cinema opened too in 1942. Built in a traditional monastery scheme, this cinematographic monument in the north of the city took advantage of its location in a corner, with a tall tower that stood up as an urban beacon above a roundabout and marquee where the ticket booth was held and the complex integrated the enormous entrance door to an open space. 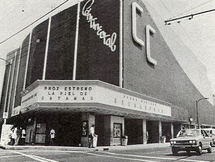 The architectural proposal of the Lindavista cinema was of simple characteristics in its composition and saturated in neocolonial details that made for a resemblance to the old Catholic temples of the viceroyalty. The entrance to the theatre was defined by a large arch and two dome volumes that conformed the facade. In the 1970s, the building suffered a great change as it became a children cinema, for which its interior decorations were traded for animal kingdom cartoons, and the tower was painted to resemble the Disney World castles. 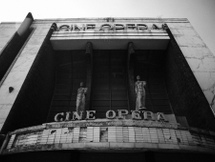 The cinema was closed and shortly after, abandoned. In time, the building underwent a slow transformation on an incomplete process to become the San Juan Diego Sanctuary.